Fiberglass doors are the most weather-resilient option, which will be sure to offer reassurance to homeowners during winter storms or on entryways that receive lots of direct sunlight. Fiberglass doors can be manufactured in a variety of styles, and in recent years the technology has advanced so that the look and feel of these doors very closely matches wood options. 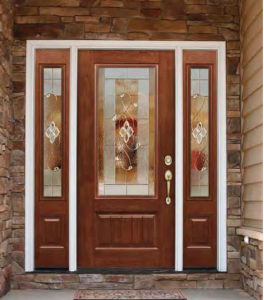 Fiberglass doors are unlike wood entry doors in the fact that they are not prone to rotting, warping, shrinking or swelling – thus requiring less maintenance over time. Fiberglass doors are an economical choice, as they pay for themselves over time by offering significant insulation and energy efficiency. 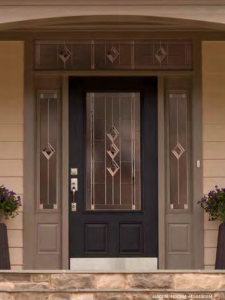 Learn more about our Signet fiberglass entry doors from ProVia here. 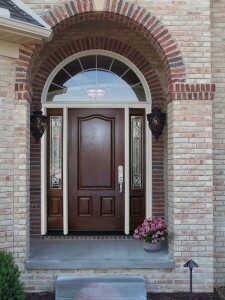 Steel doors are another good option for a replacement entry door. They are durable, energy-efficient, and customizable (their smooth texture makes them paintable in the color of your choice). They require slightly more maintenance than fiberglass doors, as they can rust over time if not properly primed and painted. They are seen in both residential and commercial settings because of their longevity and high level of security. Like fiberglass entry doors, steel models are more energy efficient than wood doors, most meeting ENERGY STAR certifications. Wood doors provide the beautiful, high-end look that other materials are designed to mimic. They perform the best in terms of resisting wear and tear over time, and are the least likely to dent or show scratches. Wood doors have remained fairly expensive due to their manufacturing process, and do require regular maintenance and refinishing every few years. They are also less energy efficient when compared to fiberglass or steel doors, however, in more moderate climates such as the Raleigh-Durham area, this may be less of a deciding factor for homeowners. The warm and inviting look that real wood provides is one your family will love. 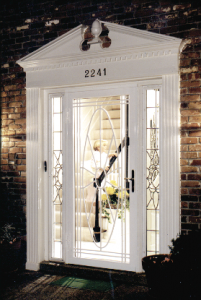 Whether you want a single, classic entry door or an elaborate double door, Gerald Jones Company is here to help! We can assist in finding a unique solution that represents your home’s style and personality. Depending on the architecture of the home, we are typically able to process design requests in a quick manner, making this a hassle-free upgrade that will do wonders for your home in the long run. View our style guide of custom entry door options here to begin dreaming about the possibilities for your new entry door! For a quote on your front door replacement, please contact us at 919-286-1700 to speak with a member of our dedicated team. This entry was written by Gerald Jones Company, posted on February 17, 2016 at 9:31 am, filed under Entry Doors and tagged entry doors, fiberglass doors, home improvement, how to choose, ProVia, replacement doors, steel doors, wood doors. Bookmark the permalink. Follow any comments here with the RSS feed for this post. Both comments and trackbacks are currently closed.